The 280 m tall high-rise on 88 Market Street, jointly designed by BIG-Bjarke Ingels Group and CRA-Carlo Ratti Associati has broken ground in the bustling Central Business District of Singapore. The tower, one of tallest in Singapore, will redefine and elevate workplace and living standards while adding an elegant new landmark to the Singapore skyline. Located in the heart of Singapore’s financial district, the new 93,000 mq, tech-integrated and verdurous skyscraper which includes the ‘office of the future’, a serviced residence and retail components, transforms the site of a former car park complex built in the 1980s. BIG and CRA were selected to design the 51-story high-rise following an international architectural competition hosted by Asia’s leading real estate company, CapitaLand. 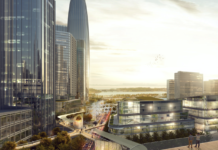 The development funded by the joint venture partnership CapitaLand Limited, CapitaLand Commercial Trust and Mitsubishi Estate Co., Ltd. is expected to be completed in 2021.  “Buildings can no longer be designed with a singular purpose or customer profile in mind - the definition of work is rapidly evolving and will continue to take on new forms. With our deep expertise in developing and managing offices, malls, serviced residences and integrated developments, CapitaLand is in a unique position to lead the charge in creating future-ready, work-live-play developments that will galvanize the community. 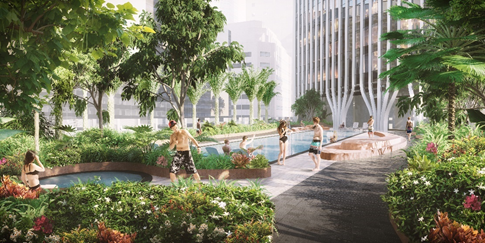 Anchoring the rejuvenation of Raffles Place, the upcoming integrated development will set a new benchmark for workspaces of the future as we harness the best-in-class design, engineering and smart technologies to empower occupants with new levels of flexibility and mobility. This will be complemented by active placemaking initiatives in the integrated social spaces to build a vibrant work-live-play community. We are excited to embark on this journey to create a sustainable, people-centric development as we lay the blueprint for the workplace of the future” Mr. Lim Ming Yan, President & Group CEO, CapitaLand Limited. Rising to 280 m, the integrated development offers premium Grade A office space, a 299-unit Citadines serviced residence to be managed by The Ascott Limited and ancillary retail space. 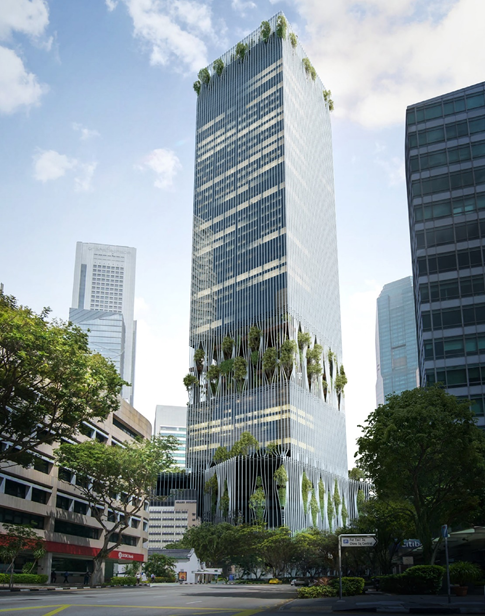 The tower is set to make a distinctive mark on the Singapore skyline: the building’s exterior façade consists of vertical elements that are pulled apart to allow glimpses into the green oases blooming from the base, core and rooftop. A dynamic interplay of orthogonal lines and lush greenery presents itself in the contrasting textures of steel and glass, interweaved with tropical vegetation. 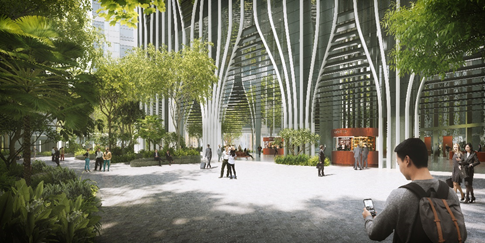 "BIG's design seeks to continue Singapore’s pioneering vertical urbanism with the 280 m tall diverse community of places to work, live and play inside as well as outside. At multiple elevations, the facade peels open to reveal urban oases for its users and the surrounding city - animating the elegant smoothness of modern architecture with the ubiquitous tropical nature" Bjarke Ingels, Founding Partner, BIG. 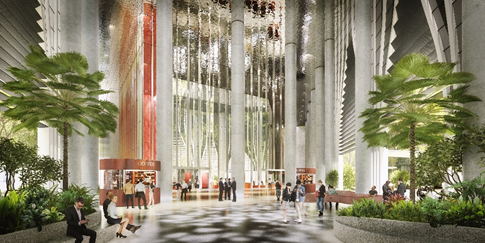 At the ground floor, visitors will be met by a public rainforest plaza and park. A series of spacious activity pockets invite possibilities for fitness sessions, temporary art installations or other community events. 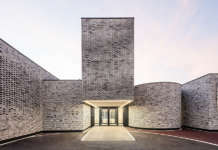 Meandering garden paths and covered passages create natural entryways into the City Room, a 19 m-high generous open space at the foot of the tower. The lush exterior will be matched by an array of hi-tech solutions shaping a series of fully responsive spaces for work or leisure. Sensors, Internet-of-Things (IoT) and artificial intelligence capabilities are scattered throughout the tower which will enable the tenants to customize their experience of the building. The City Room welcomes tenants into separate lobbies for the offices and residences, as well as shoppers and diners into the food centre within the tower’s podium. 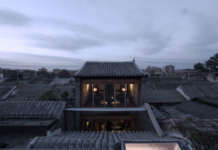 The first eight floors of the tower are dedicated to the serviced residence including a wide range of facilities such as a swimming pool, jacuzzi, jogging track, gymnasium, social kitchen, residents’ lounge and barbeque pits. 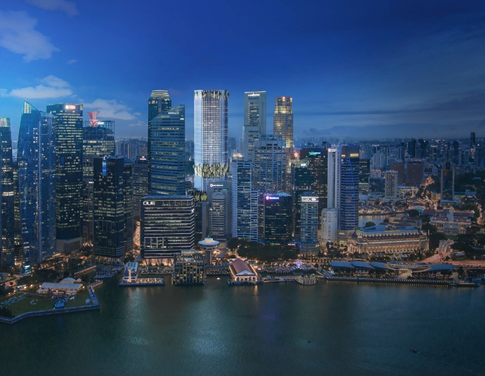 The top 29 floors of the tower offer premium office spaces with panoramic views to the Singapore River and Marina Bay. 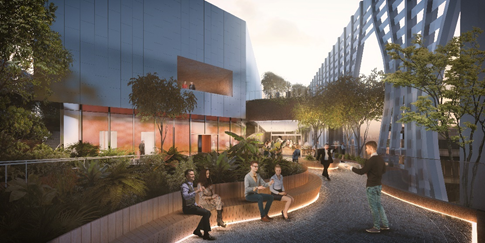 At the core of the building between the hardscapes of the offices and residences are four connected levels of organic softscape, called the Green Oasis - a mesmerizing 30 m open-air garden for work, casual strolls, relaxation, exercise and events. 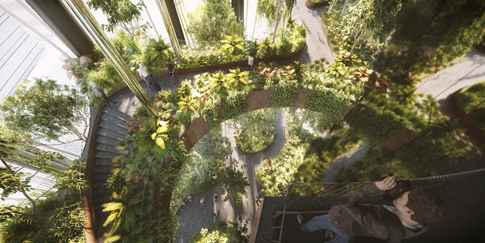 The multi-leveled oases are connected by a spiraling botanical promenade that creates multiple viewpoints of the vertical park within and the Singapore landscape outside. “As someone with Singaporean heritage, I’m honored and humbled by the opportunity to contribute to the ongoing evolution of architecture in Singapore - the home of tropical modernism. BIG’s design looks to further this local typology by distinctly yet seamlessly blending the contemporary high-rise with abundant greenery in-between the offices, residences, amenities and recreation spaces” Brian Yang, Partner in Charge, Bjarke Ingels Group. The Green Oasis is a tranquil haven of winding walkways and comfortable seating areas for working outdoors or simply lounging in the shade. 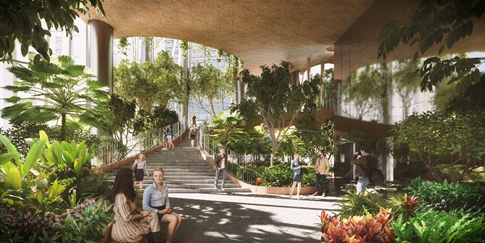 At about 100 m above ground, the tropical garden will feature a jungle gym, treetop cocoons, sky hammocks and a café. "At CRA, we aim to design spaces that can become settings for novel interactions. In this building, green areas are made accessible to the public at different heights, allowing the city’s exuberance to extend throughout the entire tower. 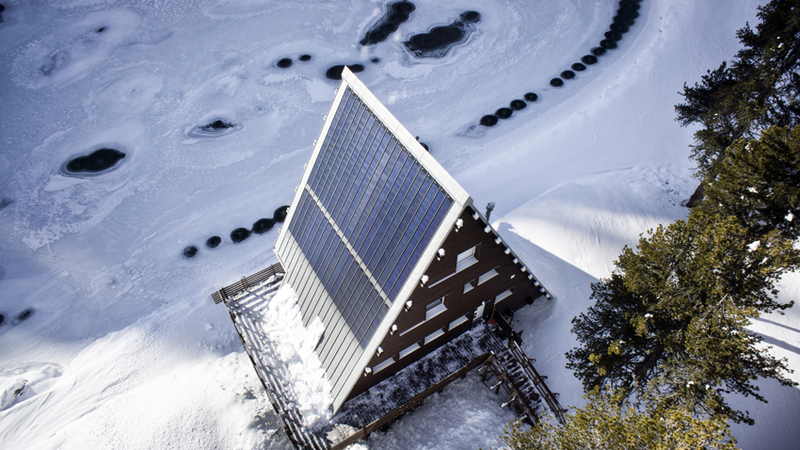 Working in nature will be as essential to the experience of the building as the most advanced digital technologies, offering us a glimpse of tomorrow's offices" Carlo Ratti, Founding Partner, CRA; Director, MIT Senseable City Lab.